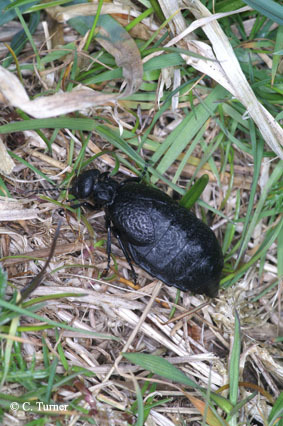 Now is the time of year to look out for the Rugged Oil Beetle Meloe mediterraneus and Oxfordshire can boast being one of this species hotspots in the UK. BugLife, the invertebrate conservation organisation, has been collating distribution data and promoting the conservation of the British oil beetles, all of which are in decline. This group of insects has benefitted greatly from increased public awareness and with the help of newly recruited recorders we now have a much better understanding of the groups distribution across the UK. Out of eight species of Oil beetle that have been recorded in the UK, four are thought to be extinct*. Of the remaining four species, two are relatively common: the Black Oil Beetle, Meloe proscarabaeus and the Violet Oil Beetle, Meloe violaceus. The other two, the Short-Necked Oil Beetle Meloe brevicollis and the Rugged Oil Beetle Meloe mediterraneus however are very rare. A female oil beetle digs a burrow and fills it with hundered of eggs. The eggs hatch and the larvae emerge. These are called triungulia** and exhibit unique co-operative behaviour. The larvae gather on flower heads, forming living pyramids so as to enable them to hitch a lift on solitary bees visiting the flowers. The bee unwittingly transports its passengers and ultimately with a little luck, they end up in a female bees burrow. At which point they hop off and make themselves at home. The larvae eat the eggs of the bee, along with any stores of pollen and nectar. The larvae develops in the burrow, eventually emerging as an adult ready to look for a mate. The short story? The more adult Meloe that are seen then the more bees there are. Obviously it is more complicated than this and a whole wealth of further information can be found on the BugLife website, along with links to the recording scheme, identification guides and the Oil Beetle Conservation Project. Staff at the HEC have been helping by identifying and providing data on specimens from Museums across the UK, as seen in this recent news article. *within the UK; not worldwide. ** their name comes from the fact that they have three claws on each foot. This entry was posted in beetles, coleoptera, entomology, HEC, identification, OUMNH, record, recording scheme by More than a Dodo. Bookmark the permalink. What a great life-cycle story but I am intrigued…do the different species of oil beetles parasitise different species of bee and have different morphologies to hitch rides on their specific hosts or are they all generalists. Given the large variety of bees visiting a large variety of specific flowers have they evolved in response to the divergence of bees? I need to know!! The British species are not specific to any particular bee species. Oil beetle females produce several thousand eggs and the resulting triungulins will attach themselves to anything visiting the flower they have climbed on to (beetles, flies and bees), thus maximising the chance of at least a few reaching a suitable bee nest in which to develop to maturity. The bees most often utilised by oil beetles are solitary mining bees of the genera Andrena and Colletes. Ninety-five years ago the University passed a decree to accept Lewis Evans' donation of scientific instruments. This was the foundation of our Museum. The post The foundation of a museum appeared first on Inside HSM Oxford.